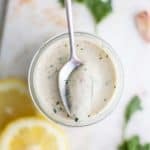 The best Vegan Caesar Dressing recipe! 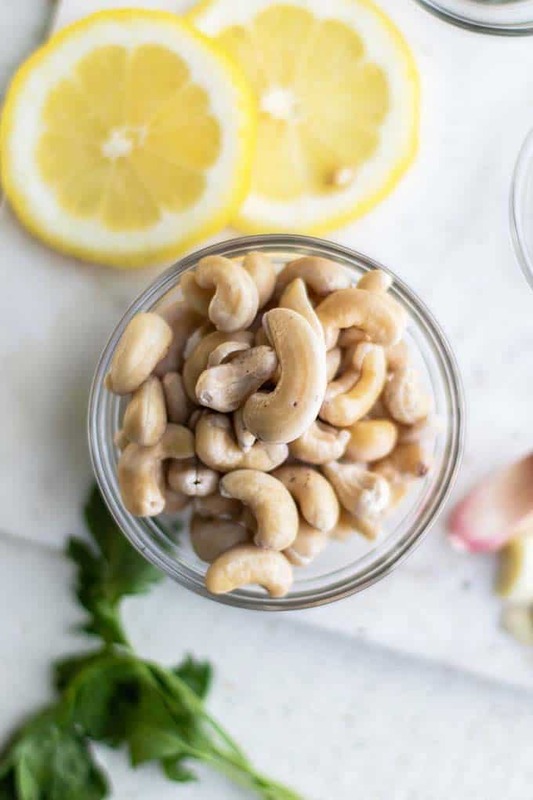 This easy recipe calls for soaked cashews, and plenty of dijon and lemon flavor. 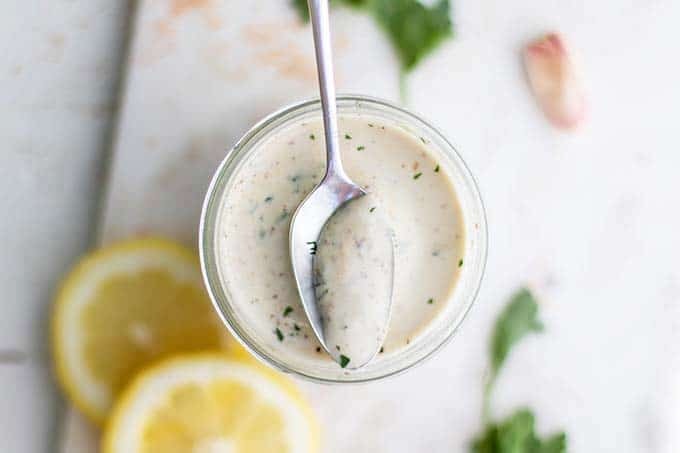 This simple recipe comes together in a blender in just a few minutes, and is a delicious vegan caesar salad dressing everyone can enjoy. I’ve never been a fan of caesar salad dressings. I do not like mayo based recipes, and so even though the idea of caesar salad appeals to me, I have always skipped it. That was until I made this epic Mexican Caesar Salad a few weeks ago. The tangy-briney-creamy dressing was over the top delicious. That version I made with tons of fresh lime juice. I knew it would be delicious made in a more classic style with lemon juice. This dressing is not just for vegans! It’s for anyone who prefers a lighter and healthier creamy dressing on their salads. It’s also great for anyone with an egg allergy, because this version relies on the creaminess of cashews. Unfortunately, if you have a nut allergy, I do not yet have a substitute for you! The only step in making this dressing that requires some time is soaking the cashews overnight. If you don’t have time for this step, pour boiling water over the cashews and allow them to sit for just an hour. Soak cashews overnight, and then drain. Add cashews, along with fresh lemon juice, mustard, salt, capers, garlic, vinegar, and some water to smooth it out. Blend well until you have a super smooth, creamy dressing — adjust water to the thickness of your liking! I’ve found that thinning it a bit more than normal better coats the salad without making it feel heavy! The Classic: Toss crispy romaine lettuce with this dressing, and then top with parmesan, vegan parmesan, or just toasted and salted pumpkin seeds (my fav!). A Healthier Sandwich Spread: Add more flavor (and nutrition) by swapping this dressing for mayo. Veggie Dip: Dip veggie sticks in this dressing for a delicious snack with protein and healthy fats. Midsummer Dream Salad: You can definitely swap this dressing in to any salad that you love. I think it would be great tossed up with all the goodies in my Midsummer Dream Salad! 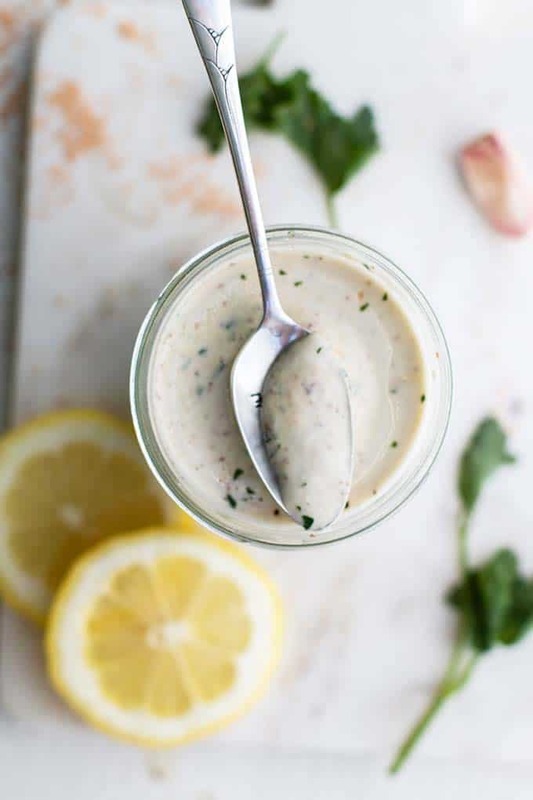 A healthy caesar dressing homemade using soaked cashews to keep it vegan and mayo free! 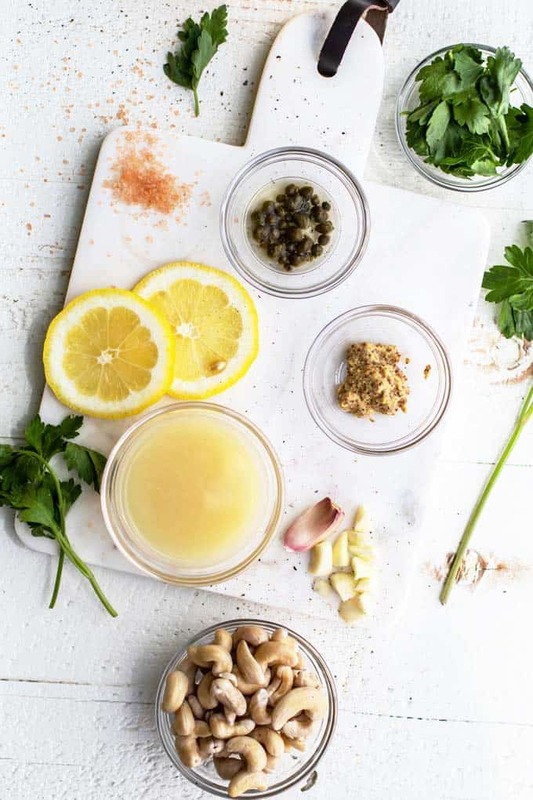 This is the perfect dressing to add some protein and healthy fats to any of your favorite salads. If you forget to soak the cashews overnight, no worries! Just add boiling water over your cashews and allow to soak for 30 mins.-an hour before blending this up! Add all ingredients to a a blender, and blend on low, progressing to high speed, for 2-3 minutes. Process really well to get the smoothest and creamiest dressing possible. Adjust the seasonings, to taste. I also sometimes add a few more tablespoons of water because I prefer a thin consistency. This Vegan Caesar Dressing post may contain affiliate links, meaning if you make a purchase, I will receive part of the sale as a comission. This helps me continue to bring you lots of fresh and inspired recipes!